Catalog Home > Acme United Corporation > Westcott® CarboTitanium® Guillotine Trimmer, 18"
Westcott® CarboTitanium® Guillotine Trimmer, 18"
CarboTitanium Bonded®: blades are eight times harder than untreated stainless steel blades. Our patent-pending process creates a permanent molecular bond with the cutting surface so blades resist scratches, marks and stains. The blades will stay super sharp and smooth-cutting for years making them an exceptional value like all Westcott®products. 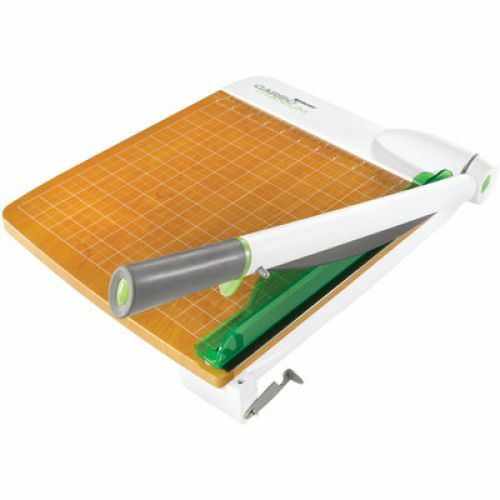 Perfect for heavy duty use, cutting through heavy fabric, boxes and plastic packages. Contemporary design for precision and performance for all your home, office and crafting cutting needs.